Thin layer chromatography has wide field of applications that include pharmaceuticals, food, cosmetics and phytochemistry. Traditional medicines based on plants and plant extracts are widely used in several countries. However, the active components in many such medicines are unknown. 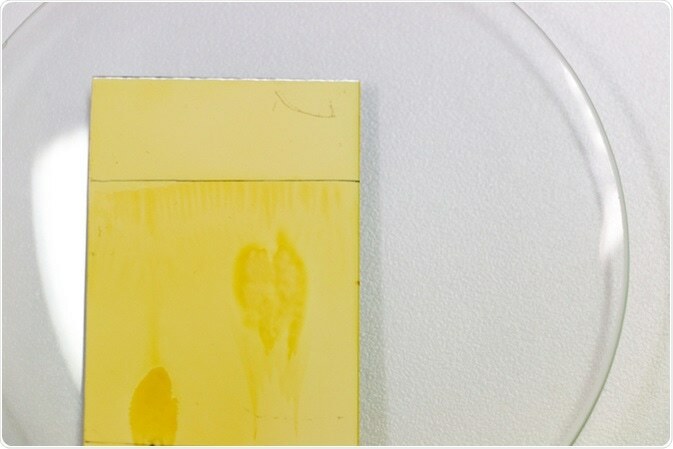 In such cases, thin layer chromatography can be performed on plant samples to separate the components. Different plants may produce different metabolites based on location and other conditions. Thus, thin layer chromatography can also be used to differentiate the metabolic state of a plant based on its location and surrounding conditions. Thin layer chromatography can also be used to identify the nature of different plant compounds: anti-oxidative, antibacterial, or antifungal. To test the presence of antioxidants, the TLC plate can be sprayed with 2,2-diphenyl-picrylhydrazyl (DPPH) and methanol. This compound, containing free radicals, is deep purple in colour. However, after reaction with anti-oxidants, it turns to yellow colour, identifying the presence of anti-oxidants. To test the presence of anti-bacterial or antifungal compounds, the TLC plate can be incubated with microorganisms. The plate can be subsequently observed for inhibited growth of microorganisms. Specific genes of plants are often genetically modified, leading to production of different metabolites. TLC can be used to compare the metabolites in native and modified plants. TLC can be used to check the purity of a sample where analysis of a compound can be performed alongside an authentic reference. Presence of an impurity can be detected by the presence of extra spots on the plate. TLC is often used to isolate, compare, and characterise the compounds and metabolites from blood, serum, body fluids, and urine. TLC can be used to separate, identify, and characterise different components colors, cosmetic products, and sweetening and preservative agents among others. It is easier to perform as it does not require any sophisticated equipment and is also time-efficient. Stability studies are required by drug administration where the stability of stored drugs needs to be tested. TLC can be especially useful in such tests, as several spots can be simultaneously run to compare and contrast. The results can also be easily visualised and spots which do not move or any change in the number of spots can indicate changes in the chemical nature and stability of a drug. TLC can be used in forensic studies where body fluids, such as urine and blood can be tested for the presence of drugs. Acidic and neutral drugs can be identified by using octadecyl silica in the stationary phase, while plain silica and octadecyl silica can be used to identify basic drugs. TLC can be used to identify the presence of drug residues and antibiotics in food, such as poultry, beef, pork, milk, fish among others. Different metabolites present in a drug can be separated using TLC. TLC has been used to quantitatively monitor the purity of several drugs, including sedatives, antihistamines, analgesics, tranquilizers, and steroids. TLC can be used to study if a reaction is complete. At the beginning of a reaction, the entire spot is occupied by the starting material. During the progress of the reaction, the spot of the starting material keeps reducing, while the spot of the products keeps increasing. At the end of the reaction, the spot of the starting material is completely gone, and only one spot of the product can be seen on the plate. Thus, complete absence of the starting spot can be used to mark the end of a reaction.